Jeanette Potter, 34, is the first known victim of a dengue fever outbreak that has since led to more than two dozen confirmed cases in Key West, and, health officials fear, may be headed north. 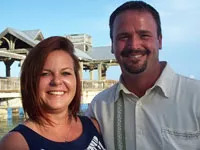 Jeannette Potter (shown here with her husband, Justin) contracted dengue fever on a 2009 vacation to Key West. WEDNESDAY, July 21 (Health.com) — Jeanette Potter was in the Atlanta airport when she started to feel a bit off. "I thought I had the flu, but it was a heavier kind of flu," says Potter, 34, who had been flying home to Rochester, N.Y., after a weeklong vacation in Key West. "I was achy. I had a headache. I was kind of disoriented." Her symptoms weren't from the flu, as it turns out. They were the early signs of dengue fever, a viral disease native to the tropics but incredibly rare in the continental U.S.—so rare that it took two weeks, three visits to the doctor, and one trip to the emergency room before experts at the Centers for Disease Control and Prevention (CDC) finally identified what ailed her, in September 2009. Potter is the first known victim of a dengue fever outbreak that has since led to more than two dozen confirmed cases in Key West, and, health officials fear, may be headed north. Also known as "breakbone fever" because of the shattering pain it causes, dengue fever is transmitted by a mosquito found in warm climates, and is not contagious. (Potter got several mosquito bites in Key West.) People often contract dengue fever without realizing they have it, but in some cases it can lead to dengue hemorrhagic fever, a severe form of the illness which causes internal bleeding and can lead to shock and even death. A day after returning from her trip, Potter felt much worse. Her aches were joined by chills, a low-grade fever, and a pounding headache that Tylenol and Advil were powerless to stop. "My head hurt so bad that I wouldn't wish it on my worst enemy," she recalls. "It hurt to move my eyes. I was getting to the point where I couldn't function mentally. I was in a fog." Oddly, Potter also noticed that her urine was discolored. She suspected a urinary tract infection, as did her doctor, Adriane Trout, MD, a family physician at Rochester General Hospital, who prescribed antibiotics. Two days later, Potter returned to Dr. Trout's office and failed an equilibrium test (like the one used in field sobriety tests). Dr. Trout sent her to the emergency room. The ER physicians originally suspected spinal meningitis, but after eight hours of tests—including a spinal tap and a CT scan, both negative—they hadn't confirmed a diagnosis. Next page: "I can't even articulate the crazy pain"
So Potter went home. "I was down and out in my bed for eight days straight," she says. "Your bones just hurt. That's why it's called breakbone disease. It's indescribable. I can't even articulate the crazy pain that you're in. You feel like you're heavy and out of your body." When Potter failed to improve, Dr. Trout began to suspect dengue fever—even though she had never before encountered the illness. "What tipped me off was she had a petechiae rash," Dr. Trout says, referring to a series of small red dots on the skin caused by broken capillaries (a form of internal bleeding). "And her [blood] platelets were low, and when I looked at her blood cells, one of the markers for a viral infection was high." After consulting with a colleague who's an expert on infectious diseases, Dr. Trout arranged for a sample of Potter's blood to be sent to the CDC office in Puerto Rico to be tested for dengue fever. The tests came back positive, and with that Potter became the first confirmed case of the fever acquired in Florida since 1934. Once widespread in the Western hemisphere (including the Southern U.S.), dengue fever was largely eradicated in the 1960s after the carrier mosquitoes were targeted with the pesticide DDT. The disease slowly rebounded after those efforts were discontinued, however, and while it generally stays confined to the tropics now, a handful of small, scattered outbreaks have occurred in the U.S. along the Mexican border over the past 30 years, according to the CDC. Since Potter's diagnosis, the CDC and health officials in Florida have confirmed at least 28 cases of the fever in Key West. More than 1,000 other residents—roughly 5% of the local population—may have been exposed without getting ill, according to a CDC report released last week. A suspected case in Miami reported last Thursday turned out to be a false alarm, but health officials are worried that the fever may spread northward. "We're concerned that if dengue gains a foothold in Key West, it will travel to other southern cities where the mosquito that transmits dengue is present, like Miami," the chief of the dengue branch at the CDC, Harold Margolis, said in a statement that accompanied the report. The symptoms Potter experienced were textbook. Often mistaken for the flu, dengue symptoms include nausea, fever, debilitating headaches, eye pain, and bloody urine. The rash noticed by Dr. Trout is a telltale sign of dengue hemorrhagic fever. Rick Branch, 41, a U.S. Navy officer stationed in Key West, was among the first cases to be confirmed after Potter. He started feeling sick on the Monday after Easter Sunday earlier this year. "It felt kind of like a hangover—though I wasn't drinking the night before," he says. "I had a foggy head. I was a little bit tired." Three hours later, Branch was freezing cold and had a fever. By Tuesday his joints were getting sore, and by Wednesday the pain was excruciating. "I could barely walk straight because the joints hurt so bad," he recalls. "They don't call it breaking-bones for nothing." He had also developed a rash, and by Thursday his gums were bleeding. "I was hemorrhaging," he says. Although Branch and his wife had looked up his symptoms on the Internet and began to suspect dengue fever, it wasn't until he was flown to Miami and saw four doctors there that dengue fever was seriously considered. Most cases of dengue fever resolve on their own within a week or two, and there's no treatment for the disease except supportive care. Even Branch and Potter—who had relatively serious cases—got confirmation that they'd had dengue only after they had fully recovered. Potter suffered through eight days of agony before her pain stopped and she slowly started to feel normal again. Now that Potter and Branch have developed antibodies to the virus, they run the risk of an even worse reaction if they're ever infected again. Potter, for one, isn't taking any chances. "I will never go to Key West again, certainly," she says. "No way."